The coffee culture in my house is pretty intense and it’s not just because my husband is Colombian (although he despises that stereotype). Every morning, nothing can be done until the coffee is made. And if we’re out and about in the afternoon, mommy needs to stop at Starbucks for an afternoon pick me up if anything is going to get done. I’ve even trained my 6 year old to make coffee! So it’s no wonder my tots are fascinated with coffee drinking and they have learned to love hanging out at coffee shops as much as I do (hot chocolate for them, even though they say they are drinking “coffee”). 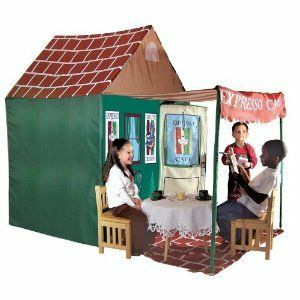 So when I saw this Cafe Playhouse, I was instantly sold. This is so cute and they love the socialization aspects of hanging out and chatting around a table, whether it’s for food or drinks. One of their favorite games is playing restaurant where they ask us for our order and then serve us. Now all I need is to get them to make real food and beverages! Fine, call me selfish, but this playhouse is my first step to making that happen! At Amazon for $49.99. Gryson & Olivia Harris by Joy Gryson FRIENDS & FAMILY Sample Sale!